This time of year, seasonal eating is often also holiday eating, as we slide from Halloween through Thanksgiving into Christmas and New Year’s. I want to take each of these in turn, give them their due, and then take a breath before the next one is upon us. Which is why I love Advent. The liturgical calendar I’ve followed my whole life gives us four weeks of contemplative preparation for Christmas, four weeks of lessons and carols and calm. But, sadly, no specific Advent foods. Advent’s a quiet period, not quite as abstemious as Lent, but still not a big feasting time. And this year, when its first week overlaps with Hanukkah and my boys are coming home from school talking about dreidels and menorahs, it’s been a little hard to keep them focused on our traditions. And who wants to compete with latkes, anyway? 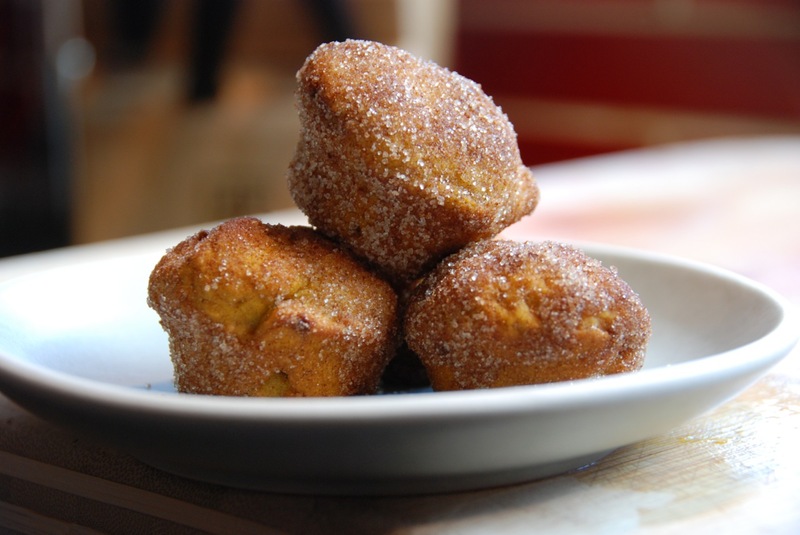 But I think I have hit on the perfect Hanukkahvent (or perhaps Adventukkah) snack: the doughnut muffin. A bath in melted butter and cinnamon sugar gives it the fried crispiness of a latke, but it is baked — not fried — to suit the more temperate Christian holiday. Compromise never tasted so good. Preheat oven to 350 degrees. Butter and flour 12 standard muffin cups, or line them with paper liners. In a medium bowl, whisk together flour, baking powder, baking soda, salt, nutmeg, and allspice. In a small bowl, whisk together buttermilk and pumpkin puree. In a large bowl, using an electric mixer, beat butter and brown sugar until light and fluffy. Beat in eggs, one at a time, scraping down bowl as needed. With mixer on low, add flour mixture in three additions, alternating with two additions pumpkin mixture, and beat to combine. Thanks for this recipe–these are one of my most favorite things, and I’ve never baked them. Though I think I might make them straight-up, w/o the pumpkin first time around. What would you substitute? or need to add? Then again, I have about 5 pumpkins to roast.